Located just outside Carlsbad in San Marcos, Camden Old Creek is a picturesque apartment community with multiple one, two and three bedroom apartment floor plans available for you to choose from. We even have large, three bedroom townhomes with attached garages that have all the space you need to entertain or even work from home. 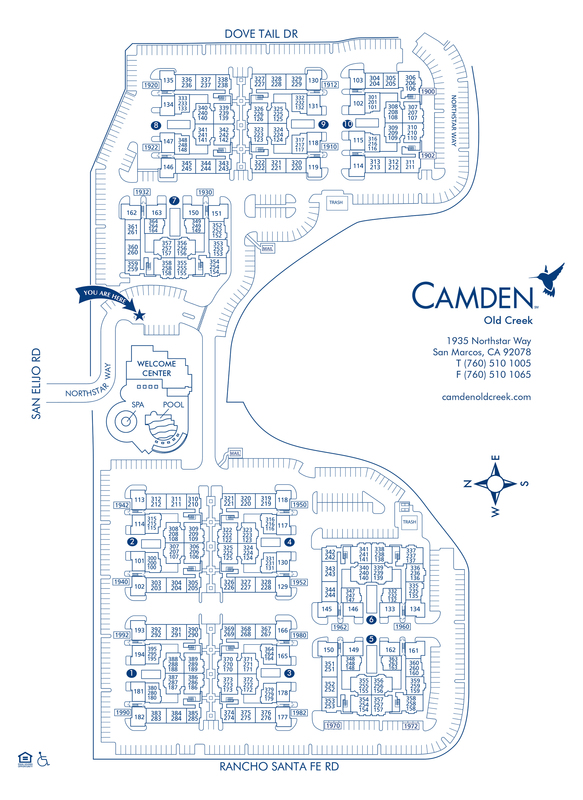 Surrounded by gorgeous landscaping, each apartment home at Camden Old Creek offers stainless steel appliances, granite countertops, wood-style flooring and beautiful cabinetry with brushed nickel hardware. Our open-concept floor plans offer ample cooking space and full-size washers and dryers in every apartment home, as well as large walk-in closets, and private patios. Say goodbye to your gym membership. Camden Old Creek offers a 24 hour fitness center and resort-style pool for all of your workout needs. Need a quiet place to get work done? Visit the wi-fi equipped business center with a private conference room onsite. Your four-legged friends will love our pet-friendly apartment community with a fenced-in, private dog park, as well as several pet clean-up stations throughout. Camden Old Creek apartments are only a few miles from the ocean, where you can enjoy some much-deserved relaxation at Moonlight Beach. Camden Old Creek is close to plenty of shopping and entertainment. Check out Grand Plaza, where you can catch a movie and unwind after a long week. With San Elijo in our backyard, Camden Old Creek is within walking distance of spectacular parks with hiking and biking trails. Camden Old Creek is proud to be zoned to the San Marcos Unified School District with great schools like San Elijo Elementary School. Located a few miles inland, between the 5 FWY and Interstate 15, you are only a few miles from anywhere you need to be. The good life is waiting for you. Come home to Camden Old Creek. Our townhomes include attached two-car garages and select apartment homes come with assigned detached one-car garages. Carports are available and are free of charge!